The opening line of this song came to me recently, because I have indeed been sewing cushions. It occurred to me I didn’t know any more beyond the first line, so I googled it to check it out. I had always imagined refined ladies sitting in salons sewing silk. However, I discovered that this song somehow combines a lullaby with a poor, overworked mother’s lamentations; her husband has gone to sea, leaving her with squawking children and an overdose of housework. Sewing my own cushions was actually a pleasure, even if one of them, The Tarvit Tapestry, was a very long-term project involving a lot of intricate work. ‘You’ll never finish that,’ my mother-in-law chirped in the National Trust for Scotland shop at Hill of Tarvit Mansion House near Cupar, back in 1995. In my hand was a pack containing a cross stitch chart designed by the Needlework and Conservation Group at Hill of Tarvit house. Part of the group’s recent work had been recovering two beautiful Regency footstools in the house. I had admired the rich colours of these and thought recreating them would be just ideal for winter evenings. A week later I was on the top floor of an Edinburgh bus with my own mother, heading for The Embroidery Shop at 51 William Street to buy the wool. 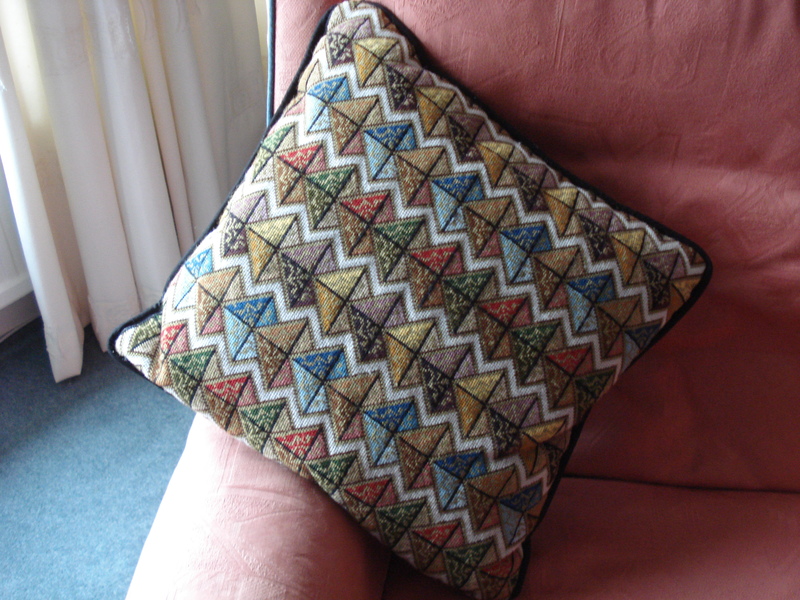 My mother loved tapestry work and had done some cushions of her own. She took great pleasure in helping me set up my canvas and I wish she were here to see my cushion completed. 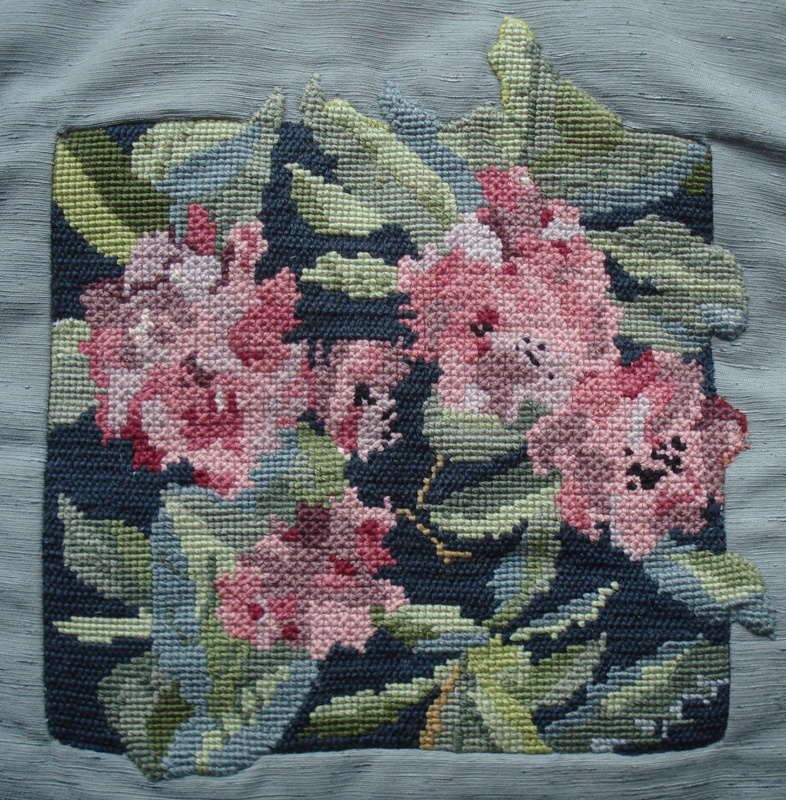 I still have two of my mother’s cushions; the design is based on a painting of a rhododendron in my childhood garden. 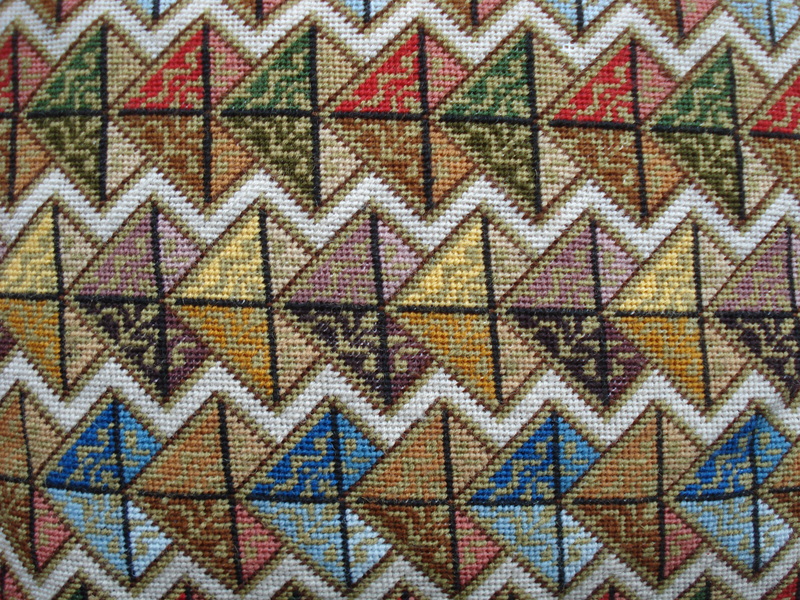 Unlike the tapestry kits I had done as a child, the pattern wasn’t printed on the canvas. Everything had to be counted out. 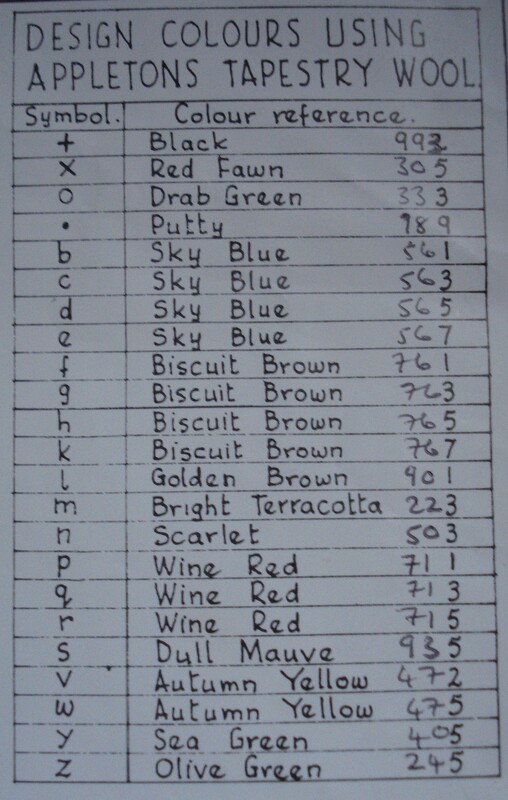 There were 23 different colours. It was hard at first but I battled on and completed three rows, which meant I had used all the colours once. Then life got too busy and the tapestry was forgotten until I retired in 2010. My eyesight was not as good, and the canvas holes seemed even smaller, but I got it out of the cupboard and had time at last. It was a fine moment last week when my mother-in-law, now in her 100th year, held the cushion in her hand. I had indeed finished it. In the meantime, The National Trust don’t seem to sell the kit any more. I wonder how many other completed (or uncompleted!) tapestries are out there. 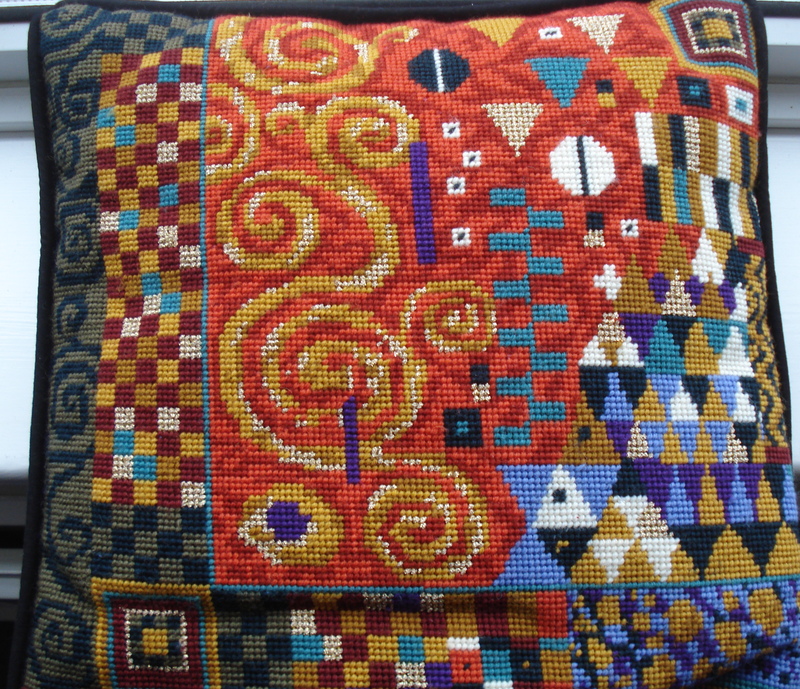 For my second cushion, done over 6 months last winter, I selected a Klimt kit on a large-holed canvas with the colours already printed on. Bliss! This makes me think of the school trips I took to Vienna, where we saw the original Klimts in Schloß Belvedere. Every cushion tells a story.